Afruz Amighi, We Wear Chains, 2018, steel, fiberglass mesh, chain, light, 144 x 160 x 18”. Afruz Amighi’s “shadowpieces” are dichotomous structures, aphotic and heavy while ethereal and effused with a gentle light. Constructed of elegant steel frameworks, they hang from the ceiling or emerge from the floor, creating dramatic shadow plays. Exhibited in darkened gallery spaces, works such as We Wear Chains, 2018, transform the rooms into cathedral-like vaults of warm luminosity and silent gloom. 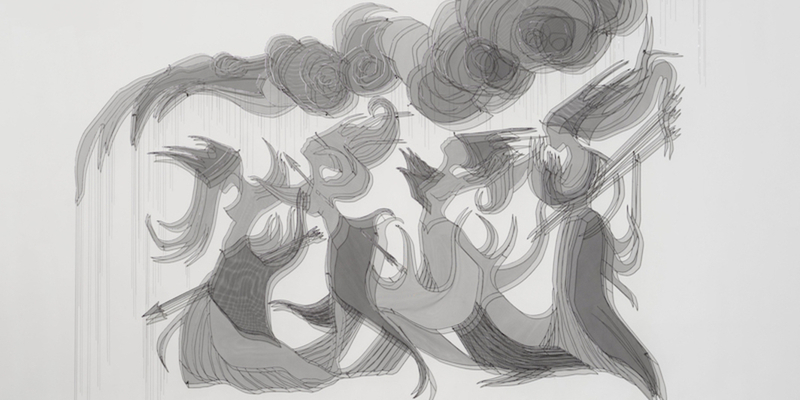 The sculpture, which confronts the viewer at the beginning of the show and immediately compels a reverential quietude, melds disparate sources such as ancient Greek vase painting, traditional African sculpture, and American antebellum silhouette prints into a chaotic panorama of hybrid figures that are at once angelic and demonic. Wearing crowns and pierced by arrows, these sinuous chimeras dance—or writhe—beneath a tumultuous sky, a glow casting umbral doppelgängers on the wall behind. Nameless, 2014, another sculptural phantasmagoria that combines steel, shadow, and light, seems to float in another room, its crystalline forms projecting grand adumbrations that resemble Gothic stained-glass windows in their scale and silky tonal subtlety. Like Chains, this sculpture draws on older art-historical traditions, such as that of Iberian mosques that were transformed into churches after the Christian reconquest. Amighi’s method suggests sedimentary layers of history accreted through centuries of sociocultural production that project obscured visions into the present through ruins and remnants. The shadowpieces form powerful allegories of this view of history, quiet dramas that stagger influences from the past like so many gossamer silhouettes.